Bonniecrest Condos enjoy an exceptional location overlooking Newport's bustling harbor, the Pell Bridge, Fort Adams and downtown. The private, gated complex is anchored by a magnificent manor house designed by renowned architect, John Russel Pope. The manor house was built in 1914 for the Duncan family, importers of Lea & Perrins Worcestershire Sauce. In the 1980s it was converted to elegant condominiums and four additional buildings were added to the expansive grounds. There is a community dock, seaside pool, tennis courts and a beautiful lawn that slopes gently to the shore. View available Bonniecrest condos, or browse other popular Newport communities. 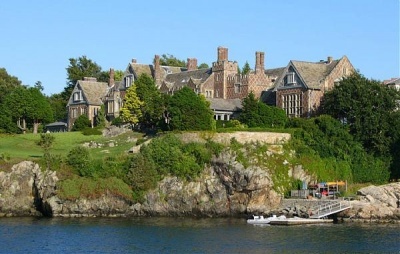 Get FREE updates and unlimited access to Newport RI MLS listings. View high resolution photos, bird's eye and aerial views of houses and condos, bookmark favorite properties, request a tour, and more! For more information about Bonniecrest Condominiums for sale contact us online or call (401) 845-9500 to speak with a Hogan Associates REALTOR® familiar with waterfrong homes and condos in Newport.